Mother Nature just won’t let up. Mother Nature just won’t let up. I know that I should not complain as the southern part of the state is not faring as well as we are. We are getting snow and more snow, and all projects are trying to keep up with what she is throwing at us. Mercifully the winds are not blowing the new snow around too awfully bad. Friday’s forecast is calling for patchy blowing snow, so some open fields might experience some drifting, so please plan accordingly. As the snow keeps piling up the big game animals are taking advantage of the packed trails, so remember if there are tracks on the trails please slow down and use caution. This new storm that we have just received has created a new hazard for snowmobiles and motorists, and that is road crossings are going to be a little more difficult as the banks are much higher. So please use caution when approaching these crossings, especially the ones that are out in the open fields. Caribou and Red Arrow will have them reroute of ITS 83 in the Madawaska Lake area opened and signed for the weekend. The new route will be using the powerline and it will use it all the way to St. Peter’s store. This trail has not been used in many years so anyone that has been riding the County will remember this trail and how much fun it was. Please stay off this section until it is completely open and signed. This is going to be a joint effort between the two clubs. Irving will be on the Sullivan road and the section of Red Arrow’s trail and will be plowing out the Coulombe road. Soldier Pond is reporting that they have been out twice and the patch on the track of the groomer is holding up. They will be working on the track this weekend and will be back out on the trails by Monday. There is still drifting on 73 where they meet up with Fort Kent. Washburn has been out on their trail 105 and ITS 83 and are reporting that their trails are in excellent conditions. ITS 83 behind the Sled Quarters is a little narrower and has been properly marked. The Aroostook Hospitality inn trail has not been opened yet but is passable. Trail 61 is not open as there is a logging operation now. There is going to be a logging operation in the Blackstone area which is trail 105 and the logging has begun so sledders please stop at the Blackstone intersection where the Nordic Lakers meet Washburn. The club would like to let people know that if you do encounter the Cat out on the trail, they will stop to allow safe passage please go slow and be cautious. If they need to pull over off to the side of the trail they may get stuck. Portage Lakers have been over their sections and are reporting great conditions. There will be a heavy logging presence on ITS 85 near the Hewe’s Brook area, please use caution in this area as the trucks will be hauling. Caribou is reporting that they have been over everything and grooming will be going around the clock. The new section of ITS 83 in the Madawaska Lake area is now open, please use this section of trail and not the road. Fort Kent is reporting that they have all their trails groomed and will be out Friday and the weekend. Eagle Lake is reporting good conditions. ITS 85N and 73 are groomed and in awesome condition. ITS 85S and 120 are being groomed as well. Central Aroostook Snowmobile club is reporting that they have been over their entire system and will be back at it once the winds die down. Ashland is reporting that they have everything packed down and will be back at it on Friday. There is still a lot of deer on ITS 85 between Ashland and Portage. 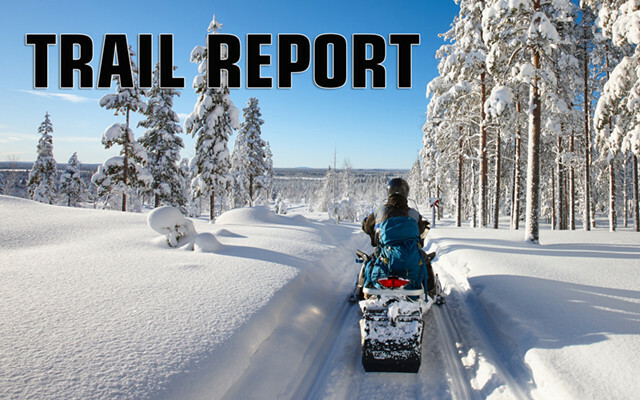 Allagash is reporting that their trails are in good shape and will be out all weekend. Don’t forget that if you are up that way stop at Two Rivers Lunch. The first 2 miles of Fall Brook are plowed, and logging is still occurring, this trail is closed during the week and reopened for the weekend. Frenchville is reporting that they will have everything groomed by Thursday. Red Arrow is reporting good conditions. They will groom the new reroute of ITS 83 Thursday and will sign it on Friday, please use caution. Aroostook River Snowmobile club is reporting that they will have everything groomed by Friday for the weekend. Possible concerns are drifting in the open fields. Madawaska is reporting is reporting great conditions throughout their system. Grand Isle is reporting excellent conditions. Trail 81A which has been rerouted will now be back in the original area, they will be installing signs shortly. Presque Isle Snowmobile club is reporting that they will have everything done for the weekend. Van Buren is reporting that their trails are in good shape. There is a small detour on ITS 81S due to some water, please watch for signs. Nordic Lakers has opened all their system and are reporting good conditions. Trail 81 has been rerouted on the Holmquist Farm, it has been marked. Please use caution as sledders will need to share about ½ mile of road with logging trucks. Caswell is reporting that they will be out today and tomorrow. Trail 100 to trail 94 remains closed. Trail 102 to trail 89 in the Connor area is now open. Please use caution as they are going through a logging operation. Logging operation on trail 81A please use caution. Limestone is reporting that they will be out on Thursday and Friday. Conditions on the trails in Southern Aroostook after the big rains have certainly been testing the Trail Masters skills but thanks to Yankee ingenuity and constant effort on their parts things are looking very good. The Benedicta Snowgang covering ITS81, 81A and 83A to Sherman are out every day but report that there is an ice jam forming at the East Branch of Swift Brook bridge on ITS#83 between Sherman and Whetstone Falls. Hopefully this jam can be removed by excavator on Thursday and the waters going around the bridge will recede. Riders can still proceed as the water is less than 6″ deep and not a long distance. With 6” to 10” of snow expected Wednesday the club should be out to groom on Thursday. In a nutshell, ITS83 – Sherman/Whetstone Falls – will be groomed on Thursday, conditions will be good/excellent. ITS81 – Sherman/Benedicta/Mattawamkeag Cutoff – will be groomed on Thursday/Friday. There are no issues on this trail, conditions should be excellent. Note: We have heard from Nate Peters, Trail master of Mattawamkeag Roadrunners – our sister club. Nate states that they have not been to the cutoff because of flooding issues. Matagamon/ShinPond/Mattagamon ITS114 and ITS85 north were groomed before this last storm and will be done again before the weekend. The snow pack is great and expected cold temps are working together to keep the conditions top notch. They report that the snowpack is deep, and deer and moose are all over the trails so stay alert! Molunkus Valley covering the Sherman area of ITS83, 3, 3A and Bible Point are constantly grooming to keep trails in excellent condition. That said, the trail to Bible Point is sharing about a mile of road and reports very icy conditions. Be careful and slow down if in that area. This is for both you and the groomer’s safety! The Eastern Maine Snow Riders Club has groomed ITS110 and filled any water holes left over from the big rain. There is a problem at ITS110 in Macwahoc as the bridge approach is flooded. Cross using the state bridge but exercise caution. With the corner that was built into the bridge it can be tricky when navigated on a sled! The club would also like to remind sledders to stay on marked trails. Some sledders are ignoring the “no trespassing” signs and going off trail. Linneus Sno-sports in Linneus has been on top of grooming this year and trails ITS83 and ITS105 are in excellent condition. The Club is now offering coffee, hot chocolate and lunch from 10 to 3 on Saturdays and Sundays. Thanks to the volunteers who are keeping the clubhouse open for the sledders and Cross-Country skiers! Big Valley Snow Club down in Island Falls reports that on ITS83 south, about a half mile out of Island Falls, there are a couple of water holes but with falling temperatures they are hoping these will close soon. 60 by May Mountain has a water hole so pay attention! The Trail Master says these are easy to get around but please be on the alert. Smoki-Haulers in Oakfield has been dealing with lots of water on 61 but report that they have opened the trail from the south and hope to have the rest groomed and ready by Friday. ITS83 is in great condition and the clubhouse will be open on Saturday for lunch. They have also opened the sliding hill for kids and adults! Rockabema Snow Rangers in Oakfield report that there is a section of ITS112 south that has an active logging operation, so sleds will be using 283. The diversion comes out on ITS83 about 1.5 miles east of the Whetstone Bridge instead of ITS85. The section is well signed and there should be no problems finding the reroute. Conditions are excellent with ITS81 to Shin Pond and club trail 62 ready for a great weekend. The Meduxnekeag Ramblers report that there are no obstacles on the railbed and it is in excellent shape. ITS83 and club trail 81 are groomed. ITS86 to St. Croix Bridge will be open by Friday. There was an attempt to groom the section of ITS86 that runs by the airport in Houlton last weekend but there were too many waterholes. The club is monitoring the situation and will get to it as soon as possible. * A Reminder: Landowners are within their rights to conduct logging operations on their own land. It is their business. They are nice enough to allow the clubs access to get from one place to another. Please show respect and stay on marked trails and use caution. ** Moose stompers is this weekend in Houlton!!! Lots to do for the family with skating, sliding contests, cross Country skiing, horse drawn sleigh rides, a great breakfast at the Meduxnekeag Ramblers clubhouse on the Wiley road from 6am to 10am and more!! Visit them on FB for more information. For sledders who are interested, there is now Snowmobile storage available for Monthly accommodations in Caribou; phone number is 207-493-3311.